Why is Otto von Bismarck not idolized as a national hero? There is no doubt that the person of Otto von Bismarck occupies one of the central places in the history of the German state. This legendary man became the first Chancellor of Germany, who, eventually, managed to unite Germany in a single unitary state. In fact, only half a century ago, Germany was a conglomerate of German-speaking mini-states. 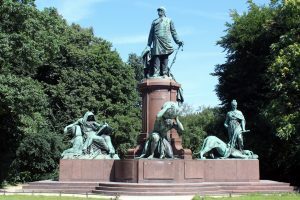 Nevertheless, despite the prominent role of the “Iron Chancellor”, in the formation of the German state as such, in general, Otto von Bismarck is not idolized as a national hero. To begin with, it is worth to note that today’s Germany is composed of extremely large numbers of small states, among which, Prussia was the largest one and most influential. Eventually, being the motherland of the future chancellor, Prussia occupied a dominant position during the process of unification. The vast majority of smaller states, such as Bavaria and Saxony, did not feel any propinquity to Prussia (Darmstaedter, 2008). Hence, basically, Bismarck was a national hero for the Prussian population, but not for the people of other states, who openly disliked the region. The next reason is not less serious and lies in a rather harsh and militaristic past of the German state. As the initiator of the two world wars that led to millions of deaths and suffering, and then, as a divided nation for long 45 years, the consciousness of the German people has undergone significant changes (Biesinger, 2006). The German nation has rejected everything that could be related to the war or even contain the slightest bit of something military. Modern Germans do not want to idealize any historical figure, who, one way or another, might be linked to the militarist past of the country. To conclude, it can be stated that despite the undoubtedly fundamental contribution to the creation of the German state, and thousands of monuments across the country, Otto von Bismarck is not idolized as a national hero. This fact determined by two significant factors. One reason lies directly in the process of unification of Germany, promoted by Bismarck, while the other lies in the changes that occurred in the minds of the German population, which took place after the unification of Germany in 1990. Biesinger, J. A. (2006). Germany: A Reference Guide from the Renaissance to the Present. New York, NY: Facts On File. Darmstaedter, F. (2008). Bismarck and the Creation of the Second Reich. Transaction. Creating a good biographical essay is a challenge unless you know where to get help. We at BuyEssay.org are always ready to provide you with fresh and qualitative essay samples, insightful articles and well-written essays. Examine this biographical essay about Otto von Bismarck to get a better idea of how such papers should be written. We remind you that any unacknowledged usage of the information from our website or blog is prohibited since it will violate the authors’ rights. If you need an essay written by one of our experts, visit BuyEssay.org and place your order. We are waiting for you!